Keeping up my recent theme of Skandinavian Christmas treats, I bring you aebleskivers, the Danish version of pancakes. Or maybe they're more like doughnuts. No matter, aebleskivers (also spelled "ebelskivers") are deeeeeelish! And they're a perfect way to brighten up dreary winter days. Like all good culinary delights, this one requires special equipment. We were fortunate to receive an aebelskiver pan from a friend who works at Sur La Table -- it's good to have friends in delicious places! -- and busted it out recently for its inaugural voyage. The basic recipe (see below) is pretty straightforward. But the real fun comes into play when you decide what to stuff these tasty nuggets with. Sure, they can be plain, but what's the fun in that? Our recent aebleskivers housed a medley of fresh blueberries, fresh currants (leftover from another Christmas recipe), and melted dark chocolate. I really liked the simple tanginess of the fruit, although next time I might try a chocolate + fruit combo for the ultimate antioxidant power punch. Mark has threatened to make a seafood version, but I voted that down as not-quite-right. 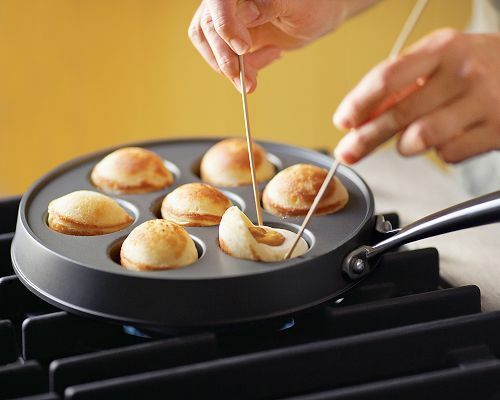 However, aebleskivers are sometimes stuffed with savory ingredients like ham and cheese, so who knows...? 1. In a clean glass or metal bowl, beat the egg whites with an electric mixer until they can hold a stiff peak. Set aside. 2. Mix together the flour, baking powder, salt, baking soda, sugar, egg yolks, melted butter and buttermilk at one time and beat until smooth. Gently fold in the egg whites last. 3. Put about 1tablespoon of vegetable oil in the bottom of each aebleskiver pan cup and heat until hot. Pour in about 2 tablespoons of the batter into each cup. As soon as they get bubbly around the edge, turn them quickly (Danish cooks use a long knitting needle, but a fork will work). Continue cooking, turning the ball to keep it from burning. Hope on over to Wanderlust & Lipstick's WanderFood Wednesday for more mouth-watering travel foodie posts. YUM!! and fresh currants? i'd go for that!